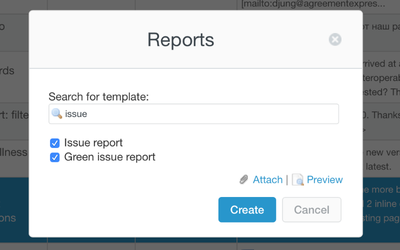 Reporter plugin is your tool to export Redmine issue data along issue fields, custom fields, sub-tasks, time spent, and notes. Reporter can create reports from single or many issues. We included set of templates that you can using already after installation. You can also build your own templates or personalise exiting match your company branding. 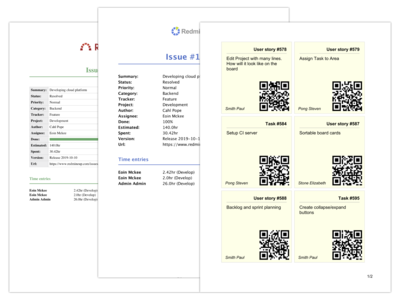 You can include any issue properties or add elements such as QR code. The templates uses the power and flexibility of Liquid markup language, so it’s faster and easier to code beautiful layouts. 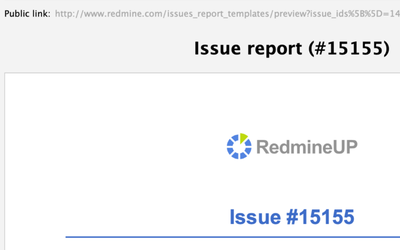 After exporting the issues to report, you can send it in a click from Redmine. You can include contacts in CC/BCC and personalise the content of the message. As solution to privacy and access to Redmine, we added access via safe public links. People who receive the links can access only prepared reports and nothing else. 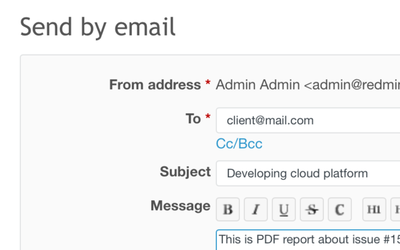 You can also attach the generated report to the tasks history. So you remember what was shared already.